Today's piece was kindly contributed to our collection by its composer, Paul Merkus from the Netherlands. It was written in 2015. This “Ballade” is composed of five parts corresponding to five musical phrases. It starts with a double prelude: a first phrase with an introductory theme in the piano, after which the flute joins in. The next part contains new thematic material and results in a first interlude of the piano, after which the flute becomes more agile and culminates in its high register. Then follows a second interlude of the piano, after which the agility of the flute continues. 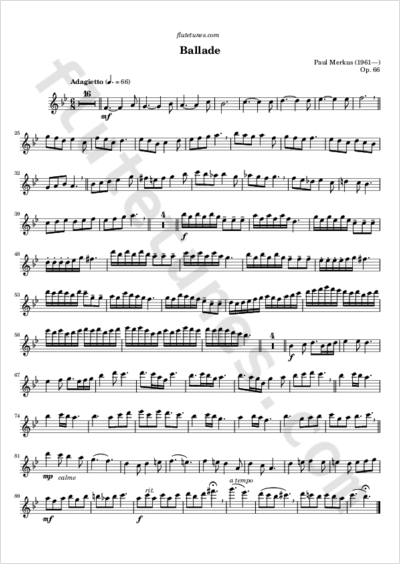 Eventually, the theme of the first prelude returns, but this time together with the flute. Hence, the circle is complete.